The last couple weeks since the previous post have been not as hectic but still productive as ever. I love the Galesburg area and the people I've met here. It's not even been a full month since I've moved here but I believe things are going to get even better as time goes on. From left to right, Bob Clark, Greg Vickers Sr., and Roy Ewalt, all of Galesburg, Ill., pray at the conclusion of the first Bible study class on Sept. 14 at the Knox County YMCA in Galesburg, Ill.
U.S. Secretary of Education Arne Duncan steps off his bus after arriving in Williamsfield, Ill., on Sept. 15. Duncan visited the town's school as part of his sixth annual "Ready for Success" back-to-school tour. Duncan listens to a speaker during a roundtable discussion on open educational resources at on Sept. 15 at Williamsfield Schools. Williamsfield Fire Protection District member Tony Byrd, of Dahinda, Ill., uses a pike pole to clear out debris after the extinguishing of a garage fire at 215 N. Poplar St. in Williamsfield, Ill., on Sept. 16. Aaron Rider, of Hugo, Okla., also known as "Melvino the Clown" in the Kelly Miller Circus, performs a juggling trick for children at Galesburg Christian School on Sept. 17. The performance addressed the importance of education and as a way to bring awareness that Calvary Assembly of God in Galesburg will be hosting the Kelly Miller Circus in October. Paul Reuschel, of Macomb, Ill., tees off during a “Cubs vs. Cards” superball golf tournament on Sept. 17 at Bunker Links Golf Course in Galesburg, Ill. Reuschel was a pitcher for the Chicago Cubs from 1975 to 1978, and is the brother of Rick Reuschel, who is also known as "Big Daddy". 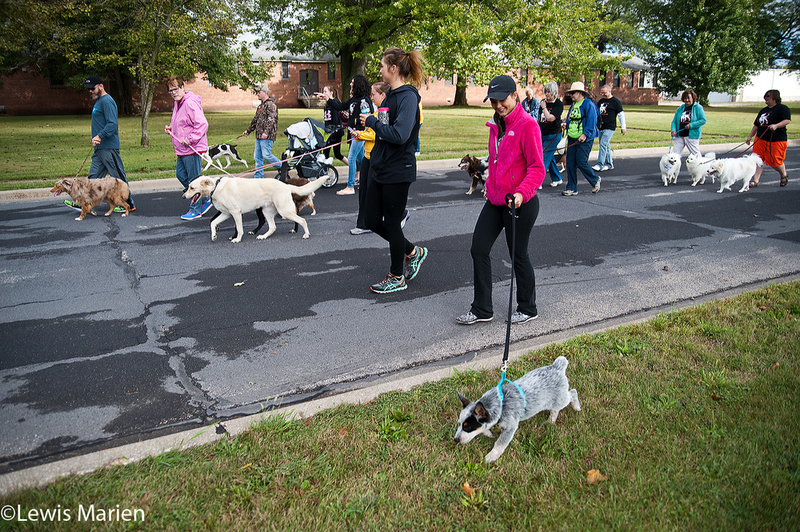 Participants walk the one-mile route during the 23rd annual Doggie Jog on Sept. 19 at the Prairieland Animal Welfare Center in Galesburg, Ill.
Max, a 7-year-old yorkie, frolics through the grass during the 23rd annual Doggie Jog on Sept. 19 at the Prairieland Animal Welfare Center in Galesburg, Ill.
Biscuit, a 12-year-old labrador, takes a drink of water during the 23rd annual Doggie Jog on Sept. 19 at the Prairieland Animal Welfare Center in Galesburg, Ill.
Lukas Villarreal, left, of Henderson, Ill., overtakes two other racers during the AMA District 17 Illinois State Motocross Championship on Sept. 20 at the Galesburg Motorcycle Club near Rio, Ill.
Craig Lee, of Ottawa, Ill., goes airborne during the AMA District 17 Illinois State Motocross Championship on Sept. 20 at the Galesburg Motorcycle Club near Rio, Ill.
Illinois Treasurer Michael Frerichs, D-Champaign, speaks at a news conference on Sept. 21 in Alumni Hall at Knox College. Frerichs visited the campus to urge Illinois Gov. Bruce Rauner and the Illinois General Assembly to approve Monetary Award Program (MAP) grant funding. South Fulton's Alex Dorethy makes a leaping pass during the Rebels' game against Abingdon-Avon on Sept. 25 at Western Illinois University's Hanson Field in Macomb, Ill. The Rebels beat the Tornadoes 32-26. The South Fulton Rebels football team huddles after their 32-26 win against the Abingdon-Avon Tornadoes on Sept. 25 at Western Illinois University's Hanson Field in Macomb, Ill.
South Fulton's Trace Hood leaps into his father's arms after the Rebels defeated the Abingdon-Avon Tornadoes 32-26 on Sept. 25 at Western Illinois University's Hanson Field in Macomb, Ill.
Dave Snyders, of Alton, Ill., makes popcorn on Sept. 26 during the 44th annual "Jordbruksdagarna" (Swedish for "earth work days") in Bishop Hill, Ill. Snyders runs Pioneer Karmel Korn, in an attempt to recreate how early pioneers made popcorn, by mixing oil and sugar in an iron kettle. The Nordic Dancers, of Chicago, perform on Sept. 26 at the 44th annual Jordbruksdagarna in Bishop Hill, Ill.